WHAT ELSE CAN A GUY WANT? Welcome to Lenny's Barber Shop! Hot lather straight-razor shaves with facials, consistent haircuts, hair coloring, beard & moustache trim, relaxing scalp treatments, leaving our clients well groomed and relaxed. Traditional old world services for modern men. Our full service barbershop provides a relaxing experience while using the best organic plant-based products available: Aveda. Every station features a 32” flat screen TV and an oversized reclining luxury barber chair. In our waiting area, our guests can enjoy a complementary cold beverage while surfing the web on our I-Pads. Our game room, with an X-Box, is a favorite with the kids. We would like to invite you to come, experience and see for yourself all that Lenny’s Barbershop has to offer. 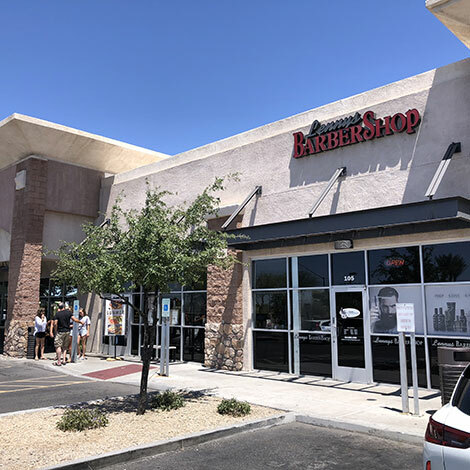 Best barber shop in Arizona!!!! I've been going here for 3 years never had a bad hair cut /beard shaping. Lenny is the the man make sure you make an appointment for him. Ronen (hope I spelled that right) is great!!! he shaped my beard and cut my hair. This guy is dialed in he knew exactly the look I was going for . They have a lifetime customer. Thanks guys/ girls. Good barbershop with nice customer service. I am always happy and satisfied with my sons haircut. I would recommend them. Stop looking for a barbershop this is the one and only. These guys know what they are doing and they get it done right the first time. The shop is always clean and everyone is always friendly. They make you feel like the only one there. Always offer you water. I never feel rushed out or like they are trying to hurry to get as many people as possibe. They take their time and make sure everything is perfect. I've been going to Lennys since it opened and will never go anywhere else. I drive 30 minutes to the Barber and it's worth every minute. I recommend seeing Lenny or Mike but literally any Barber here will have you leaving cleaned up proper. Nice, clean place with friendly barbers. They take their time and do great work. Very relaxing with a hot towel, straight razor neck line trim with hot lather, and finished with a brief shoulder massage. We are happy to provide gift cards for all of our barber services. They make a great gift for birthdays, special occasions, or just to say thank you to your family and friends. Just fill out the form below and we'll be in touch to complete your purchase! © 2018, Lenny's Barber Shop. All Rights Reserved.